ICOTS 301-Introduction to ICOTS explains basic ICOTS functionality including user roles, workflow and offender management. Information on common user login errors is also provided. Time to complete this module is approximately 20 minutes. ICOTS 302-Transfer Request illustrates the process for transferring supervision responsibilities to another state, including requirements for a transfer request and qualifications for reporting instructions. This module has an interactive training format, software simulation, and a customized participant experience and lasts approximately 20 minutes. ICOTS 303-Progress Report illustrates the progress reporting process for offenders supervised in a receiving state as required by ICAOS Rule 4.106. Completion time is approximately 15 minutes. 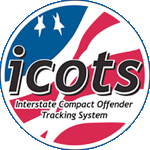 ICOTS 304-Reporting Violations illustrates the violation reporting process for offenders supervised in a receiving state and how this process impacts the sending state's obligation to retake an offender. Completion time is approximately 20 minutes.